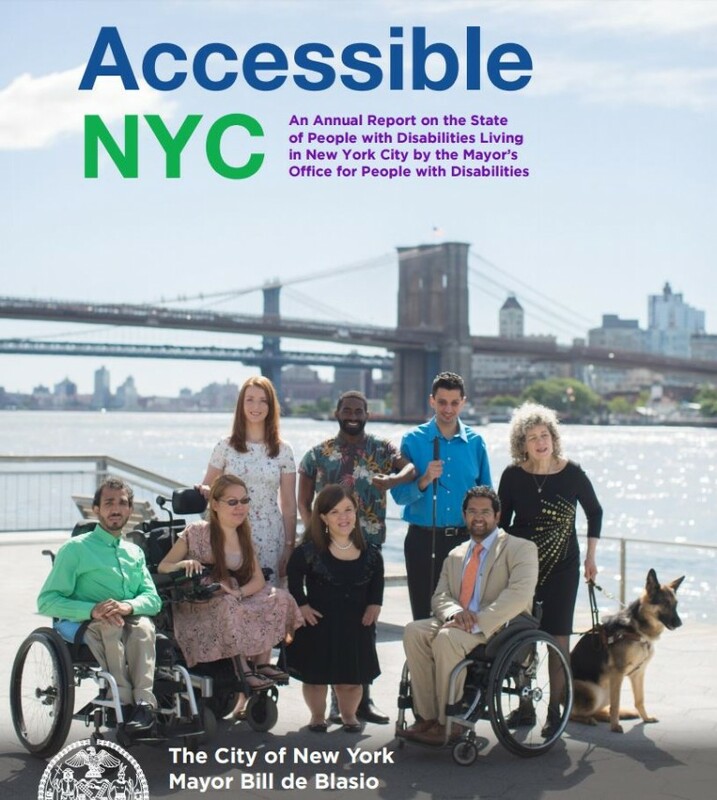 The administration last Sunday released “AccessibleNYC” – the City’s first-ever report on the state of people with disabilities, and interagency plans to improve the quality of life for the population across the five boroughs. According to Mayor Bill de Blasio, the Mayor’s Office for People with Disabilities is collaborating with dozens of City agencies to catalog current and forward-looking efforts to enhance accessibility and inclusion in transportation, education, employment and health, as well as City services, institutions and resources. Disability Service Facilitators in key City Agencies: The City has created additional full-time positions in key agencies that work closely with MOPD and act as liaisons to New Yorkers with disabilities, including the Department of Transportation, the Human Resources Administration, TLC, and the Department of Parks and Recreation. Business Development Council: MOPD’s Business Development Council provides strategic advice on best practices in outreach, recruitment, training, hiring and promotion of people with disabilities in the workforce. Expanding employment opportunities: MOPD’s NYC: AT WORK initiative, with support from the Poses Family Foundation, will connect talent to businesses and provide access to employment opportunities for a minimum of 700 unemployed or underemployed people with disabilities. The Department of Education is also partnering with MOPD to build transition centers across the City to prepare students with disabilities for successful employment opportunities in the future. Upholding 55-a Civil Service Titles: MOPD and the Department of Citywide Administrative Services are collaborating to encourage agencies to utilize the 55-a Program – which permits applicants for non-competitive positions to bypass the Civil Service Exam – to employ qualified individuals with disabilities. Creating more accessible housing for NYC: MOPD will host a housing day for builders and developers to ensure they understand the New York City Building Code requirements, the federal Fair Housing Act, and the implications of receiving City, State, and federal funds. Accessible vehicles for all, on call: By working with TLC, the City is expanding dispatch services for wheelchair users across the five boroughs so that residents can have an accessible taxi dispatched on-demand or by reservation. Supporting students with disabilities: MOPD is working in partnership with the Department of Education to provide support to students with disabilities, families and educators to offer work-based learning opportunities and professional learning experiences to ensure that students graduate prepared for their post-secondary plans, including college, career and independent living. “In the past, the needs and rights of people with disabilities were considered by government on a piecemeal basis. The creation of a Disability Agenda for NYC should provide a blueprint for the future that insures integration, participation, social opportunity and employment for New Yorkers with disabilities,” added James Weisman, president and CEO of the United Spinal Association.